I only met Alden Nowlan once in my life. I was undergraduate in Montreal and it was announced that he was coming to read, so I took all of his books out of the library. I remember that he was an imposing man with a resonant voice that had a slight rasp. I was hopelessly shy, so after the reading I approached him and said, Mr. Nowlan, I have read all your books,” to which he replied, “Thank you,” and then I scurried out the door. This fall the Icehouse imprint of Goose Lane is publishing the Collected Poems of Alden Nowlan. It is an occasion for a celebration of Nowlan’s remarkable achievement. 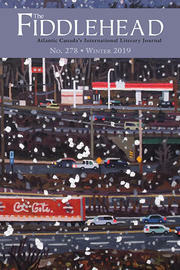 In this issue of The Fiddlehead readers will find a brief appreciation by David Adams Richards and a previously unpublished interview with Nowlan conducted just before his death by two intrepid high school students. Pause for a moment from the rush of poetry books catching your eye and read your old favorites from Nowlan’s astonishing oeuvre. Ross Leckie is the editor of The Fiddlehead.